Those who grew up near the Glen Iris Estate used to tell stories of hearing the gentle music of cowbells coming from the Mr. Letchworth's Prospect Home and Chestnut Lawn farms. This photograph is from the collection of one of those people, Mildred Lee Hills Anderson. 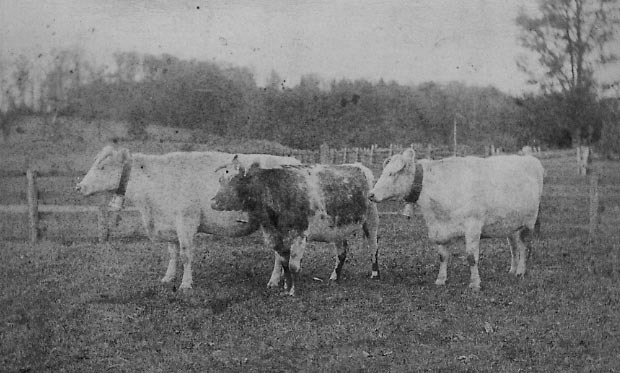 In the 1880's Mr. Letchworth built a herd of registered shorthorn cattle including the "Third Count of Belvoir", He held sales of these cattle from 1890 to 1894. The depression of 1896 helped drive him out of his breeding business. He kept his hand in farming however, stating in 1906 that "Glen Iris Dairy Farm, with creamery and stables costing $12,000, accommodates between thirty and forty cows." 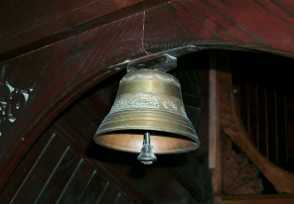 Visitors to the Park can still see the bells - some hang in the stairway of the Glen Iris as shown below.